The Hawa Mahal (the Palace of Winds or the Palace of Breeze) is a beautiful and arresting palace in Jaipur, Rajasthan. It is one of the finest and most visited architecture in Jaipur and Rajasthan as well. This unique and beautiful palace was built in 1799 by Maharaja Sawai Pratap Singh for the royal women to allowing them to observe the street festivals and other activities while unseen from the outside. 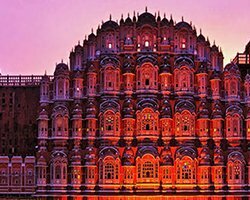 Constructed in red and pink sandstone in the form of crown of Hindu gold Lord Krishna, the grand and historical Hawa Mahal sits on the edge of the City Palace Complex, and extends to the Zenana, the Women’s Chambers. The structure and architecture of historical Hawa Mahal was designed by famous architect Lal Chand Ustad. The palace has five storey. The exterior looks like the honeycomb of a beehive with 953 small windows called Jharokhas. These small windows or Jharokhas are decorated with intricate and beautiful latticework. The purpose of the lattice work in the palace was to allow the royal ladies to observe the festivals and everyday life in the street below without being seen from the outside. The lattice also allows cool air or breeze pass through the intricate pattern and air conditioning the entire palace area during the summers. The magnificent Hawa Mahal was also the favorite resort of Maharaja Jai Singh because of the sophistication, elegance and beautiful built-in interior of the palace. The cooling effects in the palace chambers, provided by the cool air passing through the Jharokhas of the façade, was improved by the water fountains at the center of the each of the chambers in the palace. The Hawa Mahal in Jaipur has been a popular tourist spot attracting tourists from all around the world. The stone-carved screens, small windows, small casements, and arched roofs are some features of this grand and historical monument which will never fail to lure you. You tour to Jaipur city is incomplete if you do not visit this grand and historical monument. This grand palace is maintained by the Archaeological Department of the Government of Rajasthan, India.